Thanks Glenn X! Appreciate the feedback! You're good posting your own pictures, it's people quoting your pics that is frowned upon. I don't know what it is, but I just can't get behind white pants. I've never liked them. Even as a kid, I hated playing at Dallas because it meant white pants and the sun shining on only part of the field....two of my biggest football pet peeves. Not a big fan of white pants either. White pants are so generic. I'm all about burgundy pants with white tops and gold pants with burgundy tops. As much as i would miss the Redskins name. Redhawks would be an easy transition. Yeah, same here. As a kid I loved the red pants, but I always hated playing in Dallas because that was the ONE game we wore red over white. 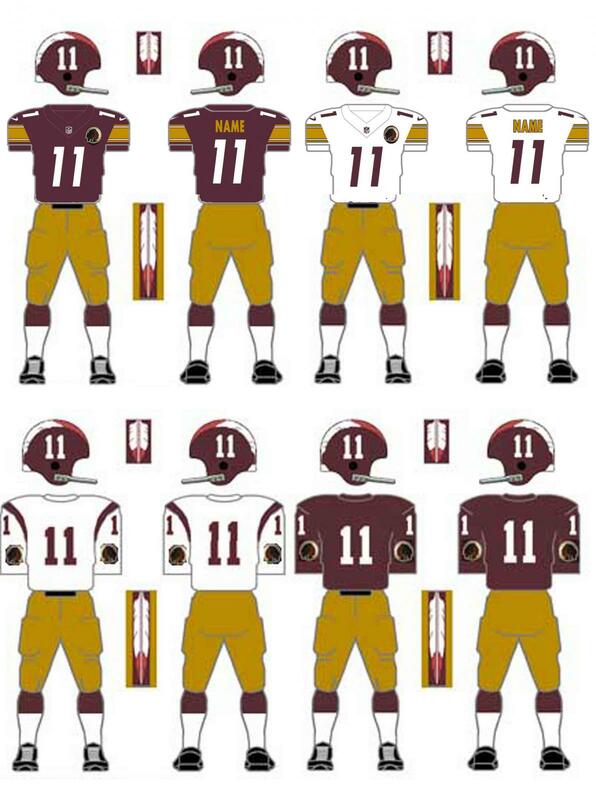 White over red will always be the 'true' Redskins uni because that's what I grew up with. I wish they would go back to that every once in a while. Thanks Gizmo, your 2nd version of burgundy over white would be my choice, always be my favorite. 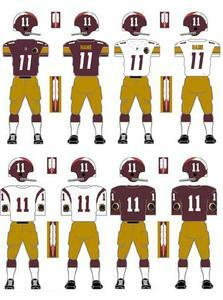 If we are going to wear gold pants at home for me I prefer burgundy tops to the white tops. Howdy fellas, how you been? Ahhh, memories. I remember well, if not fondly, earning my one and thus far only NNT via something that got merged in here. Good times...TK, how many guys you think you've slapped in irons on this one? Bout as many as will end up here in the future, I'll wager. I predict a short return. Sweet helmet. I really like the white and gold center stripe. Looks great. That looks FANTASTIC! I would love to see that helmet with gold pants (preferably with a complimentary stripe) and the 80th anniversary jersey.. only with the spear on the sleeve as our unies. Awesome job man! WHEW!! That is a sick design on that helmet! Thanks guys....I really struggled with going with stripes or not. I like stripes in general, so my heart said go with them. I'm glad I did. Stephen, that helmet is fantastic! Is that a hobby of yours? just curious what ignites the thought to do all that! Thanks man. Yeah, over the last couple of years I've been making helmets. I've sold a few, but most of them I keep. I'm starting to run out of space, so I need to be really selective on which helmets I make going forward. I love the colors and logo, everything about it. You just know what would happen from the political correctness junkies and the 4 letter, they would be all over how stereotypical and what a racial slur the logo is. Which nobody should ever mention as long as Chief Wahoo is still allowed to grace caps in Cleveland. Hell of an effort though. How great this would look with the throwbacks. I always have space available!! To me, the NFL has ridiculous rules around helmets and uniforms. I'd like the teams to have options, and what would be cool with the Redskins is the ability to incorporate some of their heritage, like your helmet above. MLB teams do quite a good job at having alternate caps/uniforms, and it doesn't get out of hand. Why can't the NFL do it too? It's a lot easier to allow a lot of different uniform/hat combos when you're playing 162 games. I can see why the NFL wouldn't want to go that route. Just look at Oregon and UNC. Seems like those two teams had a different uniform/helmet every week.